If you have ever entertained yourself by reading comprehensive electronic-theory textbooks you’ll have seen references to technologies that sound really interesting but which you will rarely hold in your hand. They may be dead-ends that have been superseded by more recent innovations, or they may be technologies that have found uses but in other fields from those in which they originally showed promise. What if you could take these crazy parts and actually build something? [Fedetft] has an interesting project that combines two of those intriguing textbook references, he’s created a thermopile that lights an LED through an inverter whose oscillator is a tunnel diode. Dig out the textbook. If you’ve used a thermocouple thermometer or a semiconductor thermoelectric generator then you’ll have encountered the thermoelectric effect. Perhaps you’ve even operated a Peltier cooling element in this mode. When a circuit is made with two junctions between different types of conductor with a temperature difference between the two junctions, a current will flow in the circuit which is dependent on both the scale of the temperature difference and the properties of the conductors. A thermopile is a collection of these thermoelectric junction circuits between metal conductors, arranged in series to increase the voltage. [Fedetft]’s thermopile uses chromel and alumel wires taken from a K-type thermocouple. He’s made six sets of junctions, and supported them with small pieces of mica sheet. Using the heat from a candle he found he could generate about 200mV with it, at about 3.7mW. Such a tiny source of electricity would be of little use to light an LED directly, so he needed to build an inverter. And that’s where the tunnel diode comes in. Tunnel diodes have a negative-resistance region that can be used to amplify and oscillate at extremely high frequencies in extremely simple circuits, yet they’re not exactly a device you’d encounter very often in 2016. 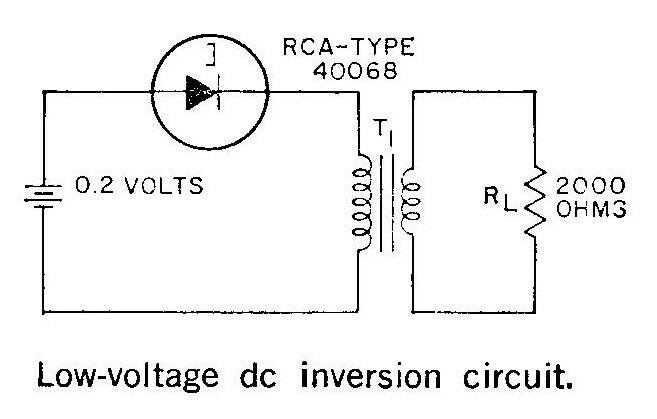 [Fedetft] has a Russian tunnel diode, and he’s used it with a toroidal transformer in an inverter circuit he found in an RCA tunnel diode manual from 1963. It’s a two-component Joule Thief. The RCA manual is a good read in itself for those curious about tunnel diodes. The resulting circuit produces a 15kHz oscillation with 4.5v peaks, and has just enough power to light an LED. While it might seem pointless to barely light an LED from a brightly lit candle, the important part of [Fedetft]’s project is to gain some understanding of two of those technological backwaters from the textbooks. And we applaud that. It’s the mark of a truly esoteric technology that it features rarely on Hackaday, and neither of these two disappoint. We’ve only mentioned tunnel diode in passing when looking at diodes in general, and we’ve tended to use “thermopile” in another sense to refer to thermal imaging cameras. One of the encyclopaedias at school fifty years ago showed how to make a thermoelectric generator, using a candle and to kinds of wire. I remember that as pretty neat at the time. You can put the generators in series for more voltage, then use a more recent device to boost the voltage. “It’s a three candle power generator”. OK, now I want a solar powered tanning bed. Hydro electric powered water pump? Not exactly hydro-ELECTRIC. But it works. There might be some use in that. Not sure how efficient an electricity-generating windmill is, but electric power transmission, generators, and motors, are all pretty efficient. The alternative would just be sending the wind down a pipe to where you need it, but that’s not always going to work, and is difficult to install. If you want a fan, and have lots of wind, might be a good idea to use a wind-powered fan. It’s called a bench, but it has to be outside. Just remembered a odd scientific journal apparently modifying the reflected/refracted wavelength would cause the matter to drop more Kelvins. So from Red they shifted the reflection to Green. Thus pulling infrared into optical range thus less atomic agitation. Granted the D.E.D was is a joke. But, how much diode tunneling could perhaps drain and cancel the thermoelectric effect and make that flame too cold to burn? I don’t know about these days, but Gunn diodes were widely used in radar detectors and speed guns for a long time as a reference oscillator and detector. I can’t find it readily, but I believe there are a couple of articles in the archives covering those. The furnace in my first house had a gas valve powered by a thermopile in the pilot flame. This had the added benefit of acting as a pilot safety. A standard thermopile puts out about 1 volt, if I remember correctly. I think it was about 5/8″ in diameter and contained maybe a couple hundred thermocouples. Here this is standard in all gas appliances with pilot flame and in gas cooking burners. 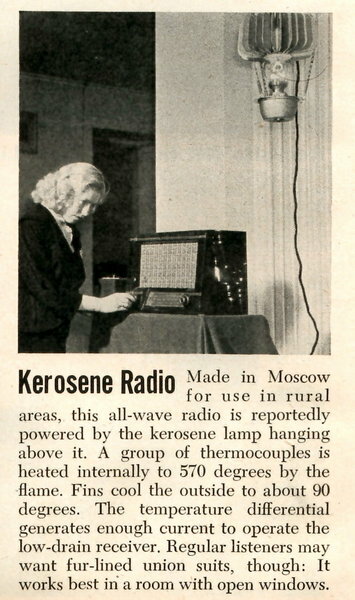 You can still find those thermoelectric generators that look like a big radiator with a hole in the middle, in order to fit the neck glass of a kerosene lamp. It’s the thing in the upper right corner of the picture. Some of them are from WW2 age and still functioning today. Actually a peltier element from a 12V car fridge works in reverse. Did an experiment once with a high power LED and four peltiers around a tea candle (heat sinks and a fan too) and got at least 20 times as much light as from the candle alone. Fridge peltier elements use a lower temp solder that TEC modules so 160 C is around maximum on the hot side. Building a DIY cell phone charger for camping or hipster meet ups, is very doable. Instead of a tunnel diode negative resistance oscillator, it may be worth trying Nile Steiner’s DIY heat treated galvanized sheet metal negative resistance oscillator.